Hi everyone! 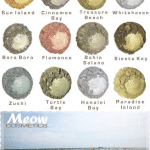 Today I’ve got the Meow Cosmetics Times Square Collection to show you. This is, of course, a seasonal collection from Meow, so it’s only available for a short period of time. Meow says this about the collection, many of these unusually complex and mysterious shades are shimmery and infused with color changing interference pigments, which play with light. It’s funny, it doesn’t seem like it’s been about a month since I was in New York City at Times Square. Let’s see what this collection has to offer! 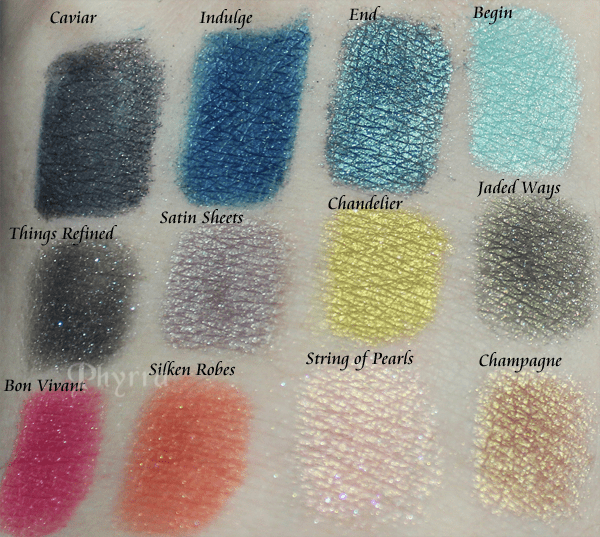 All of these swatches are on Coastal Scents Shadow Worx primer. 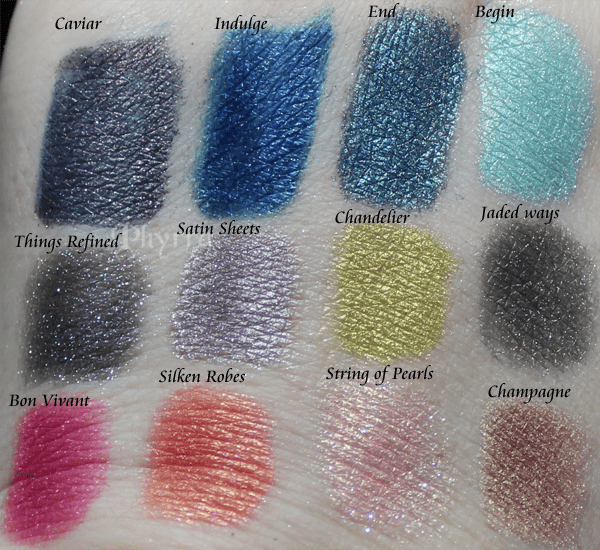 Since I always wear eyeshadow primer, and these are complex colors, they really look best over a base. 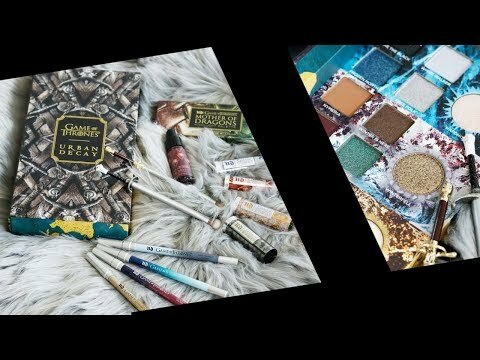 I tried to swatch on bare skin and it just looked wrong, so I started over and did it right. Purple on a blue-black base with golden and pink iridescence. Caviar is a very complex purple, possibly the most complex blackened purple that Meow has ever put out. Deep navy blue with teal-blue iridescence and sparkle. A very deep, gorgeous blue. Deep sea blue base with teal iridescence and sparkle. This is a very multi-dimensional, deep teal. I love it. Soft seafoam with aqua tones and gold iridescence. This reminds me a bit of Time Foretold, from the Midnight Clear collection. 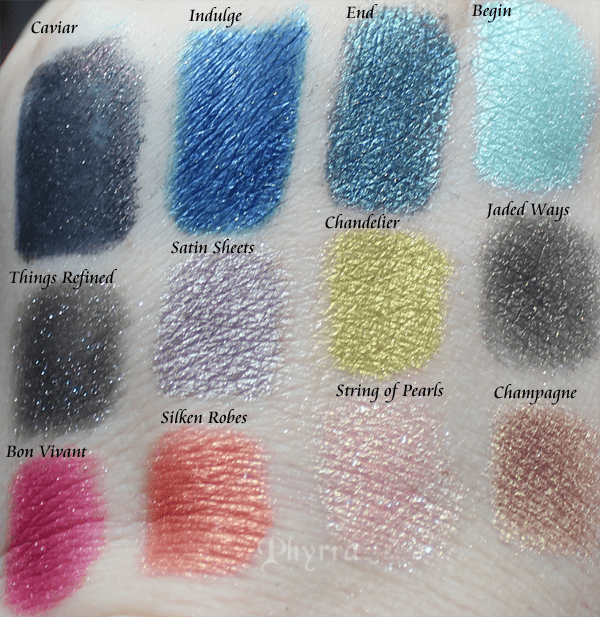 Soft charcoal grey base with strong rainbow sparkles. Absolutely beautiful. This reminds me of Fyrinnae Immortality. Everyone needs one of these in their collection. Greyed lavender with gold iridescence. It’s an unusual shade that I can see as an unexpected neutral for the office. Metallic chartreuse. This sort of color always reminds me of Meow. Unapologetically bright and fun. Deep green with brown undertones and golden iridescence. This color embodies wood nymph. Bright hot pink with coordinating shimmer. I love bright pinks like this. If you like UD Woodstock you’ll love this. Bright peach with golden iridescence. Reminds me of UD Free Love. I love this color! Light peachy-coral with golden iridescence and pink sparkles. Delicate, feminine, an dfun. I really love this one. Pale gold with deeper gold undertones and gold sparkle. It’s a gold. How can I not love it? Champagne, String of Pearls, Caviar, End, Silken Robes and Indulge. 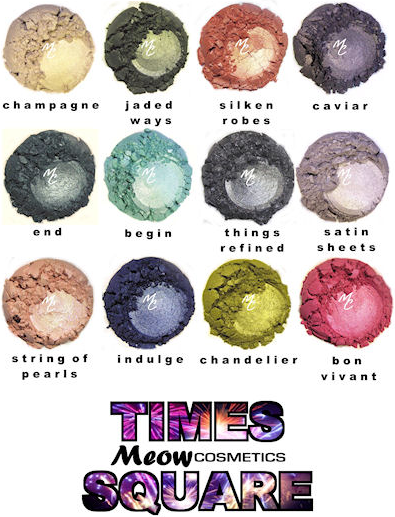 What are your favorite colors from the Meow Cosmetics Times Square collection? I already purchased full sizes of Champagne and Indulge….now you’ve got me wanting End and String of Pearls… I also love Begin but I have almost every other aqua Meow has made…lol. I think I may pick up Silken Robes and Satin Sheets! Chandelier is so unique! I really love all the shades on the bottom row, Bon Vivant, Silken Robes, String of Pearls and Champagne! I’ve been wearing Satin Sheets all week! This is one collection I am stocking up on before it disappears. Learned my lesson after missing my stock up window on Friday the 13th! String of Pearls and Satin Sheets. I’ve been lemming them for ages.